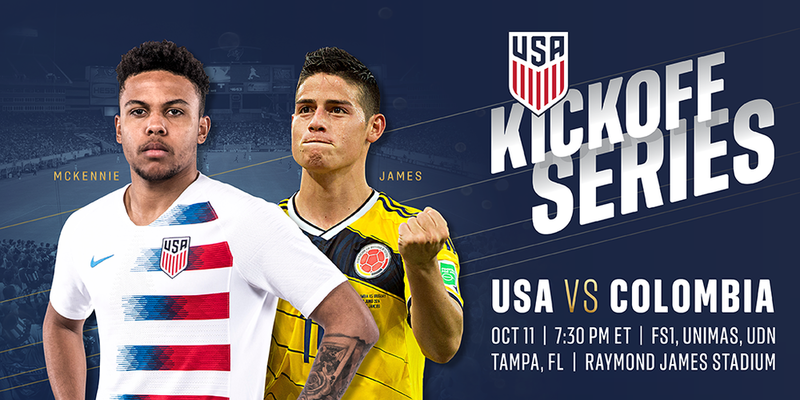 CHICAGO (Aug. 2, 2018) – The next stop of the fall Kickoff Series will take place in Tampa on Oct. 11 when the U.S. Men’s National Team hosts 16th-ranked Colombia at Raymond James Stadium. FS1, UniMas and UDN will broadcast the match live beginning at 7:30 p.m. ET. The match falls on an international fixture date, which makes all players available for selection. Tickets go on sale to the public Thursday, Aug. 9, at 10 a.m. ET through ussoccer.com and by phone at 1-800-745-3000. [Note: Tickets are not sold at Raymond James Stadium except on the day of the event. ]Groups of 20 or more can order directly at ussoccer.com. Ultimate Fan Tickets (special VIP packages that include a premium ticket, a custom-made official U.S. National Team jersey with name and number, VIP access to the field before the game, and other unique benefits) are also available exclusively through ussoccer.com. The U.S. has faced Colombia 18 times since 1961, more than any team from South America. The MNT hasn’t had great success against the perennial power, holding a lifetime record of 3-12-4. It’s been more than a decade since the last U.S. win, a 3-0 shutout on March 9, 2005 at Titan Stadium in Fullerton, Calif. The two have played each other in significant tournament games, including a FIFA World Cup and multiple editions of Copa America. In the 1994 World Cup held in the United States, now-MNT General Manager Earnie Stewart scored the winning goal in a 2-1 victory against of the tournament favorites in its second group stage match. The MNT returns to Tampa following the 3-2 win against Martinique in the 2017 CONCACAF Gold Cup. Overall, the USA holds a lifetime record of 4-1-1 at Raymond James Stadium. Nine different U.S. players have put their name on the scoresheet in those matches, including two individual multi-goal games (Landon Donovan, Jordan Morris) and three scored by defenders (Carlos Bocanegra, Clarence Goodson, Omar Gonzalez).